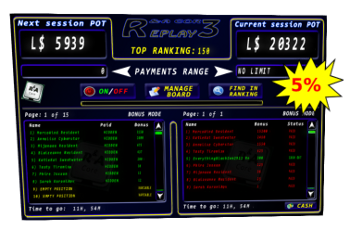 Cash replay is given over the amount you play during a day. You can come in the next day to collect this amount. You collect it by clicking the Cash button on the board. When you play e.g. 10 games costing L$100 each and the replay is 5% you get 5%x10x100 = L$50 in cash replay. Do not forget to come back to collect your cash. At the bottom of the board you see the time to go. When the time is finished, a new day start. You can collect your cash in the 24 hours after that. * Click the button Cash in order to cash out your winnings. The board will pay you and send you a message. The only thing you have to do to get this reward is to come back the next day and click the Cash button. The reward is a simple 5% of what you played. Don’t forget to cash and don’t play a lot if you know you can’t come the next day to cash. You can use the knowledge that you’ll get 5% back, when determining what to play and how much. When the replay is 5% and you win more than 95% of your money back on the game and the other rewards then the 5% extra of the Replay3 Cash is enough to make sure you are a winner, playing with a profit. Of course don’t overlook the Replay3 Credits, giving you even more back.